Juicy and tender steamed pork spare ribs in black beans sauce. A classic dim sum dish delicious on its own or with rice. A must try! I recall with fondness, memories of my late mother and I eating at dim sum restaurants whenever I visited her in Ipoh. It was always an exciting time, especially for my children when we headed to the dim sum restaurant with my mom. My family and I enjoyed the whole experience of choosing from a wide variety of delectable dishes served in small steamer baskets and little plates. Char siew bao and siew mai were my mom’s favourite while I loved har gao and chee cheong fun (rice noodle roll). Steamed pork ribs in black bean sauce was also one of the dishes that I looked out for when the dim sum aunties rolled their carts over to our table. Besides the wonderful food, I loved the festive-like atmosphere filled with boisterous chatter and conversations. There was never a dull moment. It was a wonderful bonding time for the whole family. My mom was the happiest when surrounded by good food and good company as she was a very sociable person. Till now, my children always remember that their amah bought for them large helium-filled balloons after one of those dim sum meals. How I miss her and those days. 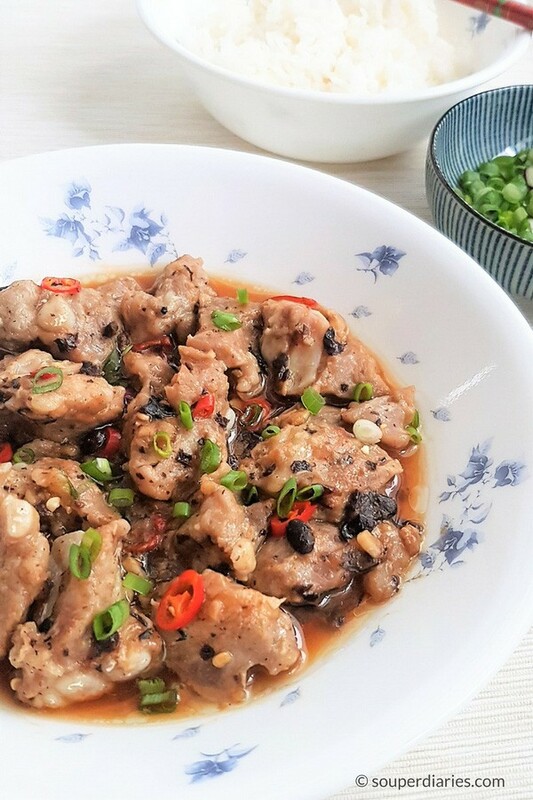 Now, whenever I hanker after this steamed spareribs with black bean sauce, it’s not really necessary to go all the way to a dim sum restaurant as it is so easy to make it myself at home. The ingredients to marinate the rib pieces are quite flexible. Sometimes, I’ll use oyster sauce instead of light soya sauce and vice versa. Other times I add both. The must-have ingredient for me besides the fermented black beans in this dish are the chilis as I like it to have a little heat. One to two cili padi (bird’s-eye chillies) is enough for me so that the spiciness do not overpower the dish. The key ingredient in this steamed pork spare ribs dish is the fermented black beans (also known as salted black beans). It is the oldest-known food made from soybeans. A precious commodity in ancient China, they were recorded to be buried together with high ranking officials. These beans provide an earthy, salty flavor to any dish you add them to. Usually, I will mash them slightly with the back of a spoon before using but today, I left most of them whole for presentation purposes. Wash the spare ribs and drain. Try to get pork rib tips or soft bones (with no bones but just cartilage) so that you won’t bite onto bones when you eat them. They are also more juicy and tender and very flavorful. Add baking powder and Shaoxing wine to the ribs and coat them well. Cover and let stand for an hour. Rinse and pat dry. Prepare your condiments in a bowl. Add the pork ribs and massage the marinade into the pork by hand (wear a pair of disposable gloves when doing this to avoid chili burn. To maximize the flavors of this dish, let it marinate overnight in the fridge. Doing this will also help to make the ribs softer and more flavorful. 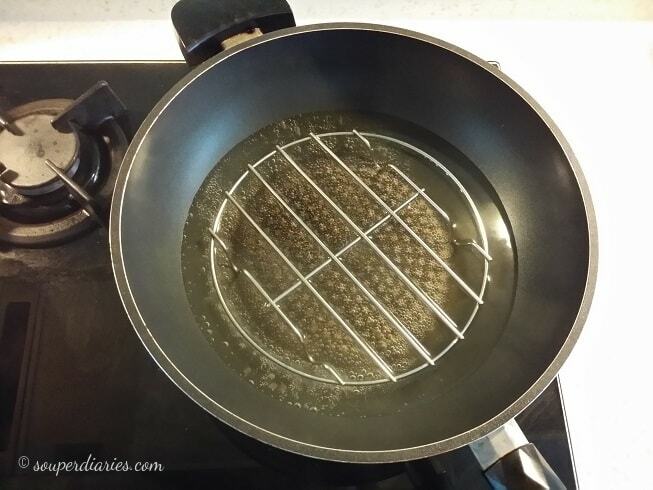 Prepare to steam by filling a wok with about 1/3 full of water and place a steaming rack inside. Bring the water to a boil. When the water starts boiling, carefully set the plate of ribs on top of the steaming rack and cover with a lid. Steam on medium-high heat for about 30 minutes or until the meat is cooked through. Serve this delicious dish as dim sum or as part of a complete meal with rice. 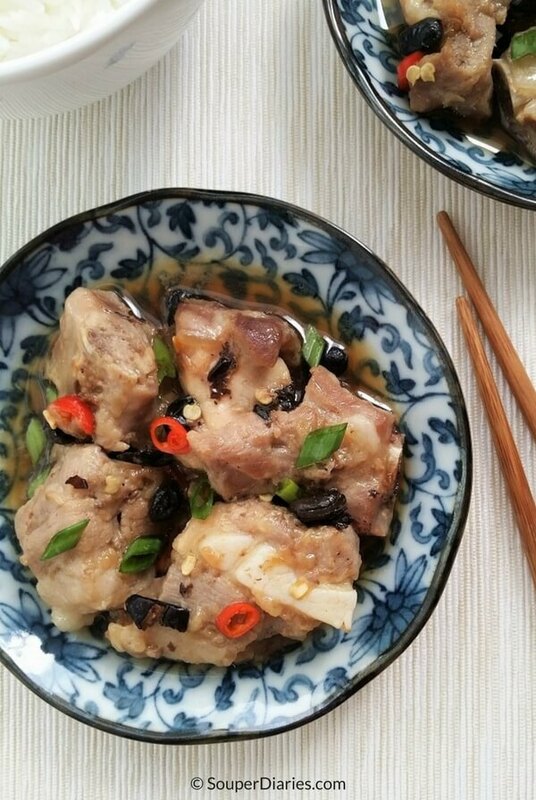 A classic and delicious dim sum style steamed spare ribs in black bean sauce. Wash the spare ribs and drain. Add baking powder and shaoxing wine to the ribs and rub to coat. Cover and let stand for an hour. Wash off the baking powder thoroughly from the spare ribs. Prepare the marinade ingredients in a bowl. Add the spare ribs and massage the marinade into the ribs (wear a pair of disposable gloves when doing this to avoid chilli burn). Allow to marinade for at least an hour. For better results, marinate overnight in the fridge. When ready to steam, arrange the spare ribs in a single layer on a heatproof plate. Fill a wok with about ⅓ full of water and place a steaming rack on the wok. Bring water to a boil. Once boiling, carefully place the plate of ribs on top of the steaming rack. Close the cover and steam on medium heat for about 30 minutes or until the ribs are completely cooked. Check that the water does not dry up during steaming and top up water if necessary. Garnish with spring onions and serve immediately on its own or with rice. 1. The longer you marinade the pork ribs, the more flavorful it will be. I usually leave them in the fridge overnight to marinate. 2. Leave the fermented black beans whole if you want a better presentation and clearer looking sauce. 3. You can also steam the spare ribs on low heat for up to an hour for softer texture. 4. Oyster sauce may be used to replace the light soy sauce. You know how to make me hungry that is for sure. I love it when you share these recipes because I like trying out foods prepared differently than what I am used too. I think the fermented black beans kind of intrigued me. Thank you. This is one great dish that I enjoy from dim sum restaurants. But it always comes in a small portion. I didn’t know it is so simple to make. Just a question, if I replace the tsaoshing wine with FooChow red wine, will it work? I can’t wait to give these a try. It looks really, really good and we’ve been missing our favorite dim sum restaurant from before our move. I may even try this with some chicken thighs I have thawing for tonight’s dinner. I’m betting this marinade works for grilling the pork as well. Thanks for the recipe. I don’t think it would be a good idea to grill with this marinade as the fermented black beans may get burnt. However, if you do try it, let me know how it turns out! I love ordering this dish when I go for dim sum. It’s one of my favorites! I’m definitely going to have to give this one a try. And your pictures are beautiful. Salivating as I read through your blog post, just curious, any substitute for the Shao Xing wine if I can’t find it at a local grocery store? You can substitute with dry sherry. This looks soooooo good! Love the printable recipe! Look good but I don’t eat pork or beef I know that your food is seasoned right though do you have recipes for foods with fish and chicken? You can find fish recipes here and chicken recipes here. Thanks for dropping by! It must be close to lunch because the entire time reading this my stomach was growling and my mouth watering. This looks delicious! I always have a hard time with a wok. It never seems to get hot enough and the vegetables end up limp. What wok brand do you recommend? It depends on what type of wok you’re looking for. For deep frying, stir-fries or when I want my food to have a good sear, I recommend using a stainless steel wok. All Clad has many positive reviews. You can also find a range of stainless steel wok here. 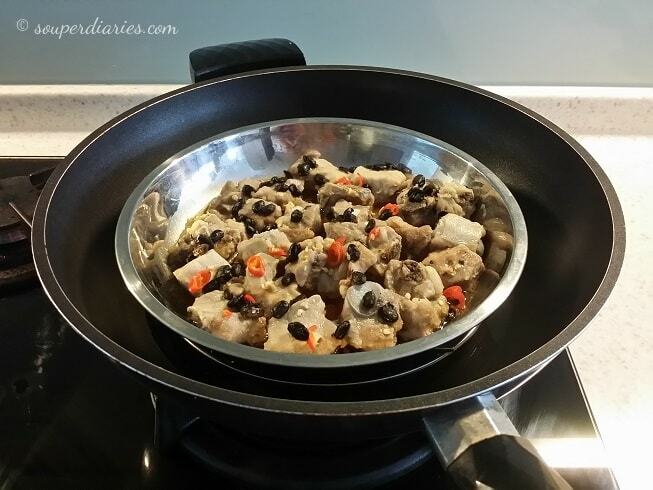 For certain types of food like tofu and eggs, I like to use my Happycall wok pan which has a non-stick surface. You can check it out here. What I like about Happycall’s IH range of cookware is that it can withstand high heat and it is also induction compatible. I must admit, the fermented black beans are an ingredient that I’m not crazy about. However, this dish does look and sound amazing. Have you ever made it with regular black beans? If so, how does it the affect the overall taste of the dish? When using the fermented beans, can you really taste the “fermented-ness” of the final product? The black beans in this dish has to be the fermented kind. 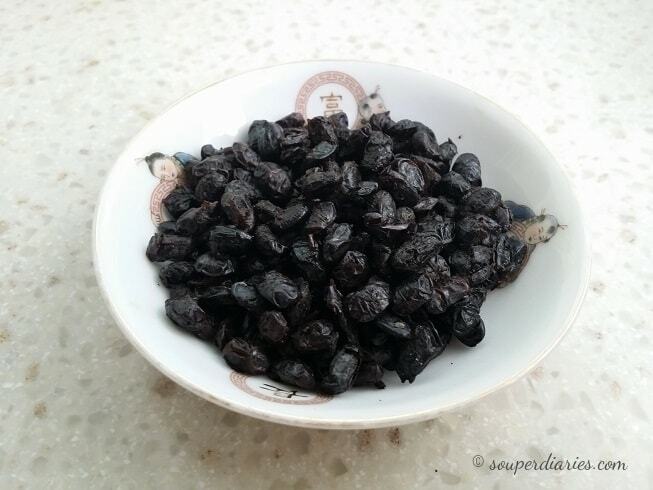 The fermented black beans has a unique salty taste which you can definitely taste. Regular black beans are more suitable for stews and soups like this Chinese Black Bean Soup. Looks delicious. I never tasted Chinese food. I love Japanese food. I think they might be different. But I’m willing to try this one especially others that I saw on your website. Well I wasn’t hungry when I sat down and turned on my laptop, now I’m starving. That looks superb, one for next weeks menu without a shadow of a doubt, I’ve been saying for a while I need to be a little more adventurous with food so no excuses now. Prep time 9 hours? I guess that’s the marinating time? How long is prep time excluding marinading? I love meat. What you call Dim Sum, is almost like our Nigerian Nkwobi, though in this case, it’s prepared with either goat meat or beef. So when I started reading your post, I was stuck. You sure have a good taste and I enjoyed how you wet our appetites with your experiences. It’s a job well done. Keep it up. DIM SUM = YUM YUM! I lived in San Francisco for 17 years. My neighborhood had numerous Asian restaurants, many of which served delicious dim sum. For a treat, my late wife and our extended family would meet for a “Sunday brunch” of dim sum. On other occasions, I would venture to the take out area and bring home dim sum deliciousness for my wife and me to enjoy at home. Now that I live in New Hampshire, it’s not so easy to find! So thank you for giving such a great, detailed recipe to prepare it on my own. I’ve cooked my own Asian food for decades. Yet I did not realize that the bamboo steamer absorbs excess moisture. No wonder they are so frequently used in Asian restaurants! I’ll have to add one (or maybe two, as I’ve seen them stacked up to steam various foods simultaneously) to my kitchen tools. While in San Francisco, I would stroll to the Asian grocery stores, find the ingredient I was looking for with English on the label, then use the Asian characters to locate the same product WITHOUT English (I feared the version with English might have been adjusted!). And even though I’m now in New Hampshire, I’m lucky that our local organic market carries many Asian spices and products. I loved how you both describe the steps to make this dish, then offer the recipe as well. I know what we’re having for Sunday brunch! Thanks! I love Dim Sum and it too gives me fond memories of family gatherings eating and enjoying each other’s company. My eldest brother usually orders at the restaurant and he will usually get a variety of dishes so everyone can enjoy the food. Steamed pork ribs in black bean sauce always make the list, as do chicken feet with black bean sauce, pork buns (char siu bao), prawn dumpling (har gao), har cheong fun, etc. The recipe looks quite easy to make. I like that you can prepare the marinade the day before and just leave it overnight and then steam it the next day. Being a busy mum it’s convenient to do the prep work and then have it ready for when you need it. I love har gao and prawn dumplings too. Yes, you can leave the pork to marinade overnight and then steam it the next day. This will allow the flavors to be better absorbed. As a busy mom, sometimes I’ll make a bigger portion and save some to reheat another day. 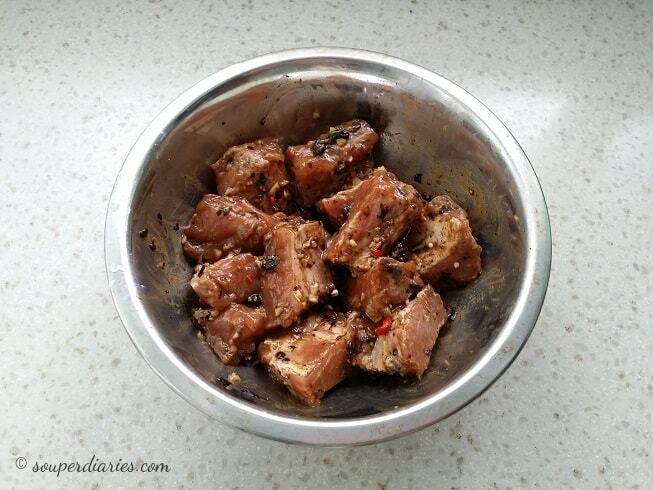 Dishes that are suitable for reheating include Steamed Chicken with Black Fungus and Dried Lily Buds and Jiu Hu Char. You keep doing an amazing job with these blog posts! This is another recipe I’m adding… thank you! Love your site and am anxious to try this recipe. Dim Sum is one of my favorites and this looks yummy. I like that you included the Wikipedia link to the fermented beans (maybe better for it to open in a new window?). I also peeked at your BRAISED SHIITAKE MUSHROOMS WITH BROCCOLI recipe and it looked great as well. I’m going to try both soon! What a great guide you have here. Unfortunately, I cannot consume pork due to personal beliefs. However I do know some friends who would surely enjoy this recipe. The photos you have makes the dish look tantalizing and flavourful! What do you think about using different meats for this recipe? Can people use like chicken or lamb instead of pork? Would love to know how you think it would turn out! I recently had dim sum for the very first time at an Asian fusion restaurant. Ever since I’ve been interested in cooking some for myself but never did because it looked so hard. After reading your article though I’m thinking I might just give it a try. I was wondering where you can buy fermented black beans? Also, is there not a risk of the cling wrap melting when you steam it like that? Thanks for this awesome recipe! You can buy fermented black beans from Asian grocery shops and if there is a Chinese food section in your local supermarket, you can try that too. So far, I don’t have any incidents of the clingwrap melting but I’ve updated the recipe to use foil to be on the safe side. Thanks for your comments and questions!